A colleague just sent me a manuscript about differences between bacterial cells growing in broth (or in soft agar) and the same cells growing on agar plates under conditions where they can use flagella to move across the agar surface. This is important work. When we study cell physiology we usually use cells that are growing in well mixed broth, because this lets us assume that all the cells are experiencing the same conditions (stochastic molecular-level factors excepted). An aside: For similar reasons we usually use broth cultures in exponential growth, because we expect the physiology of such cells to be independent of the culture density. Once the density gets high enough to affect cell growth, the culture will no longer be growing exponentially, and minor differences in cell density can cause big differences in cell physiology. Unfortunately many microbiologists are very cavalier in their interpretation of 'exponential', and consider any culture whose growth hasn't obviously slowed as still being in log phase. The usual lab alternative is to grow then on the surfaces of medium solidified with agar. This is quite convenient, as most kinds of bacteria can't move across the usual 1.5% agar, so isolated cells grow into colonies. The density of cells on an agar surface can get very high (a stiff paste of bacteria), because the cells are being fed from below by nutrients diffusing up through the agar. Depending on the agar concentration, the film of liquid on the surface of the agar may be thick enough (?) to allow bacteria that have flagella to swim along the surface. 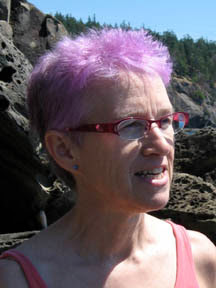 Because the bacteria often move side-by-side in large groups this behaviour is called 'swarming'. 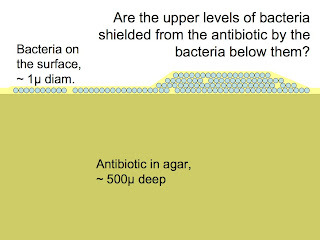 Often swarming on agar surfaces is facilitated by surfactants that the bacteria produce, which reduce the surface tension of the aqueous layer. I've always assumed that bacteria living in soil and on other surfaces produce such surfactants as a way of getting surface-adsorbed nutrients into solution (that's how the surfactants we use in soaps and detergents do their job), but maybe surfactants are also advantageous for moving across surfaces with air-water interfaces, such as damp soil. 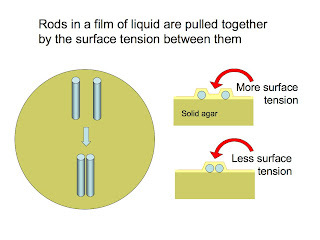 The side-by-side cell orientation and movement may also be a consequence of surface-tension effects, as illustrated in this sketch. But why would more dense bacteria be more resistant to an antibiotic? One possibility is that the individual cells aren't more resistant, but because more cells are present, more cells get lucky. If this were true we'd expect the number of cells in the 'background' to be directly proportional to the number of cells plated. A more common interpretation is that the presence of other cells somehow protects cells from the antibiotic. We know that resistant cells can protect sensitive cells from some antibiotics, if the mode of resistance is inactivation of the antibiotic. This is especially powerful if the resistant bacteria secrete an enzyme that inactivates the antibiotic, as is the case with ampicillin. This effect occurs both in broth and on agar plates. But can sensitive cells protect other sensitive cells? Might dying cells somehow sop up antibiotic, reducing the concentration their neighbours are exposed to? Might an underlying layer of sensitive cells protect the cells above them from antibiotic? The big problem I see is that bacteria are so small that concentrations will very rapidly equilibrate across them by diffusion. The agar in the plate is about 500 µ thick, and the cells are only about 1 µ thick, so there should be far more antibiotic molecules in the medium than the sensitive cells can bind**. Thus I don't see how a layer of sensitive bacteria could use up enough of the antibiotic to significantly reduce the effective concentration for the cells above. Even if the cell membrane is a barrier to diffusion of the antibiotic, there's going to be enough fluid around the cells for the antibiotic to diffuse through. ** But I haven't done the math. OK, back of the envelope calculation puts the number of molecules of antibiotic at about 10^15/ml (assume a m.w. of 5 x 10^2 and a concentration of 5 µg/ml). The density of cells on top of the agar might be 10^12/ml. If each cell were to bind 1000 molecules of antibiotic (that seems a lot, but maybe it's not), they would together bind up all the antibiotic from an agar layer equivalent to the thickness of the cell layer. But the thickness of even a very thick layer of cells is no more than a few % of the thickness of the agar, so the overall antibiotic concentration would only decrease by a few %. I could be entirely off, but would another possibility be that more bacteria close together = easier conjugation of antibiotic resistance genes between them? The layering theory could even contribute to this effect, I think, by slowing down their exposure; this may give them sufficient time to conjugate the genes.